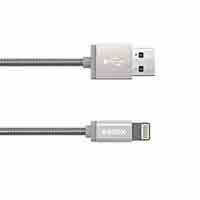 The Premium DuraFlex Lightning Cable lets you connect your iPhone, iPad. or iPod to any USB port to easily charge and sync your device. The premium aluminum finish matches your Apple device while our DuraFlex cable increases durability and offers a tangle free charging solution. Charge and sync your iPhone/ iPad with style. Available in 5 premium metallic colors: Gold, Rose Gold, Space Gray, Silver, and Matte Black: the DuraFlex Lightning cable will complement any Apple device. The 4 FT length is convenient in most situations. This premium Lightning cable is constructed with DuraFlex, a durable yet flexible metal housing that offers premium protection. Designed for everyday use, this cable will never fray and never tangle.